Claudine, 34, lives in the African nation of Rwanda. She and her husband are casual labourers who work on farms near their village. The going wage for day labourers is 20,000 Rwandan francs/month (about $32 CAD). Even with both of them working, it is not really enough to meet the basic needs of their family. They have four children, the youngest is just one and a half years old. Life has been difficult for Claudine, but some wonderful things are happening in her community that are giving her new hope. About a year ago, ADRA began to work in her village with a program that was designed by ADRA Canada and funded in partnership with the Canadian government through Global Affairs Canada. Called EMBRACE, the program works to improve the lives of mothers, newborns, and young children. Claudine heard about the program from a neighbour. Together they decided to take their children to the ADRA health screening to get them weighed and measured. They were astonished to discover that their babies were found to be malnourished. Claudine decided to join the program and it has changed her life! Every day as Claudine brought her baby to the ADRA EMBRACE program for the nutritious meal, she would also sit in on the health and nutrition classes that were being taught. 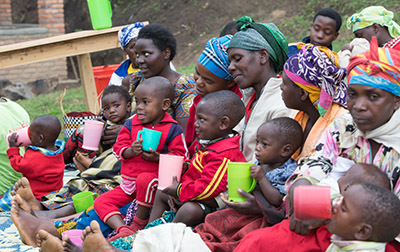 Here she learned about the importance of feeding her children balanced meals, to ensure they get all the vitamins and minerals they needed to live a healthy life. She also learned how to start growing a variety of new vegetables so that she would be able to prepare these same wonderful meals right from her own kitchen garden! In March of 2017, Claudine was selected to receive a cow as part of the EMBRACE program. Claudine’s family will not be the only ones to benefit from the cow. As part of the program each family that receives a cow will give the first female calf to another family in need. In Rwanda, the gift of a cow carries a special significance as the families then become friends for life.